If you think Mediteca sounds familiar, it’s because it’s managed by the Island Group Hospitality company which has once managed the Nero Group restaurants. Medi stands for Meditarranean, so you’ll expect various Southern European cuisine, and best still, the whole menu is dotted with porky delights. That’s right, they have only recently relaunched the menu and I’d say that is a great move. 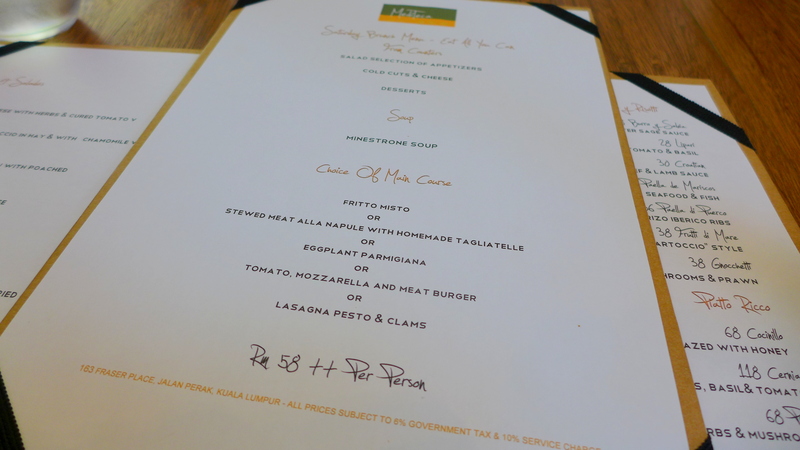 Last Saturday, we had the pleasure to sample their brand new Brunch menu. Every Saturday, there will be a different Mediterranean theme for diners to relish. 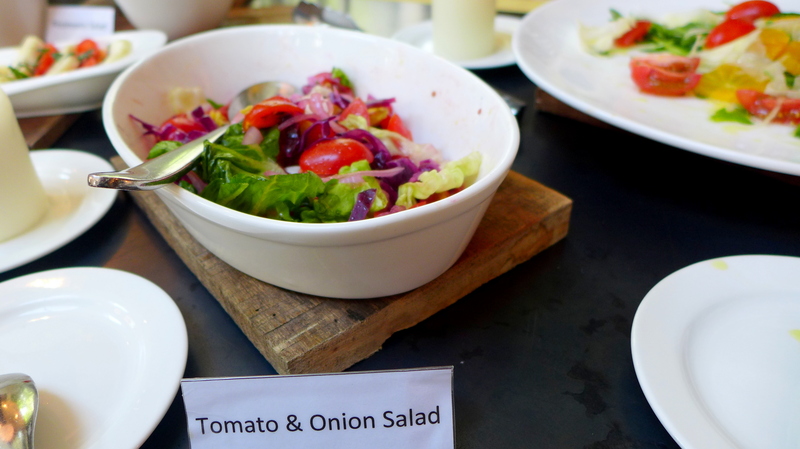 There’s a salad bar, all-you-can-eat cold cuts and cheese and various desserts for you to choose from. You get to choose your main course from 5 options and load yourself up with bottomless Ice Lemon Tea. Sounds like a great deal? All for only RM58++. Probably one of the most reasonably priced brunch with the quality of food they are serving. So, while my mum and sister were sweating it out in Italy that weekend (I’m totally not jealous, really! ), we had our Italian themed brunch buffet to distract myself. Look at this beautiful slicer! Walking in the restaurant blessed with plenty of sunlight, this promptly took our attention. 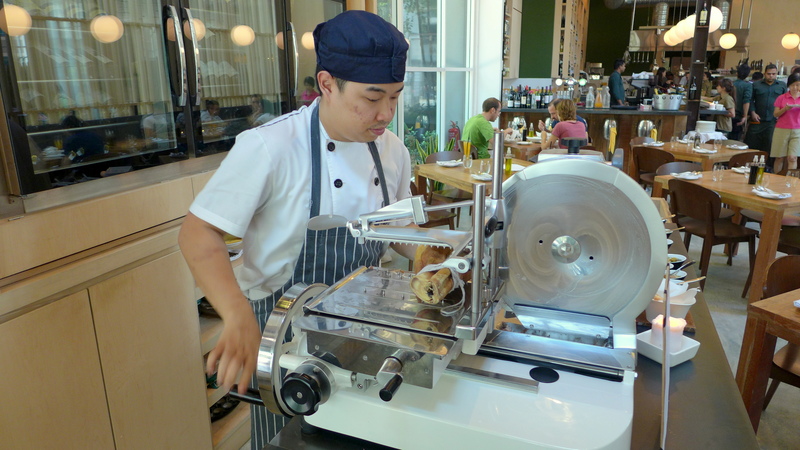 The industrial slicer is specially imported to produce super thinly sliced cured meat. Trust me, it makes a huge difference when the cold cuts are thin enough to melt in your mouth. 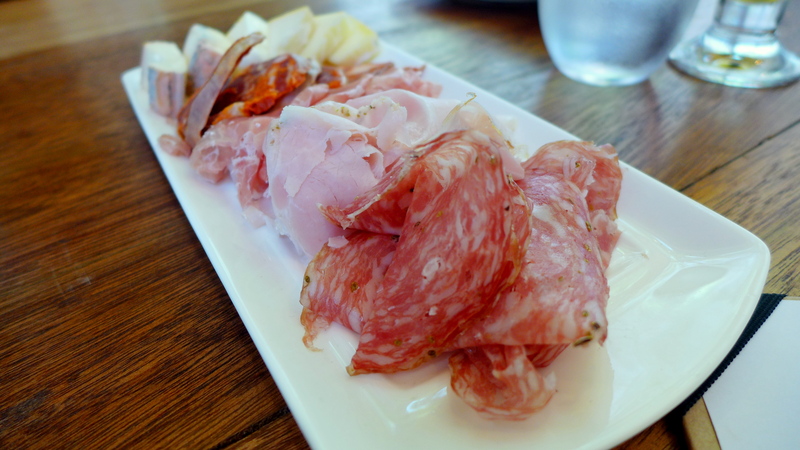 Speaking of which, here’s our plate of delightful cold cuts and cheese. Very good hangover cure, I should say. Ahh…. I can munch on these all days. Especially the prosciutto (somewhere in the middle). The chorizo is the real deal too, with lovely smokiness from the paprika. These are all imported of course, so quality is guaranteed. A sight for sore eyes indeed. They have a range of pickles and jam made in-house, and you can pair them however you want. 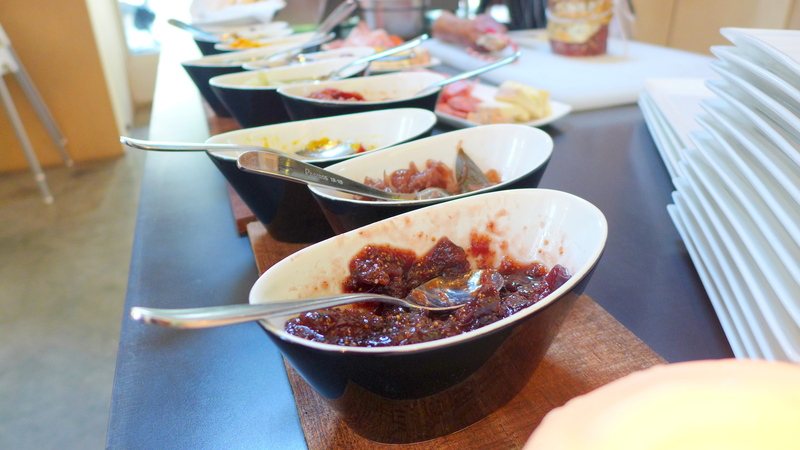 I love the quince jam with the soft cheese, and the onion jam with prosciutto. Of course, if you feel that the amount of cholesterol is catching up on you, feel free to grab some colourful salad to offset the richness. Hehe. 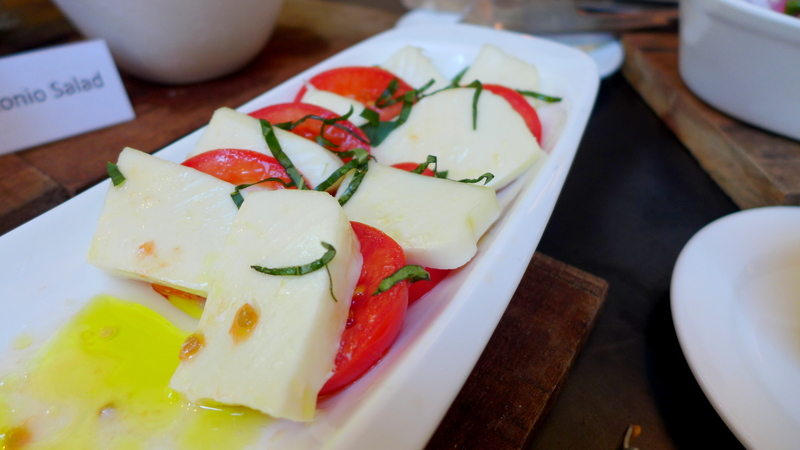 But I was a little naughty and went straight for the mozzarella. Mmm. That was good. 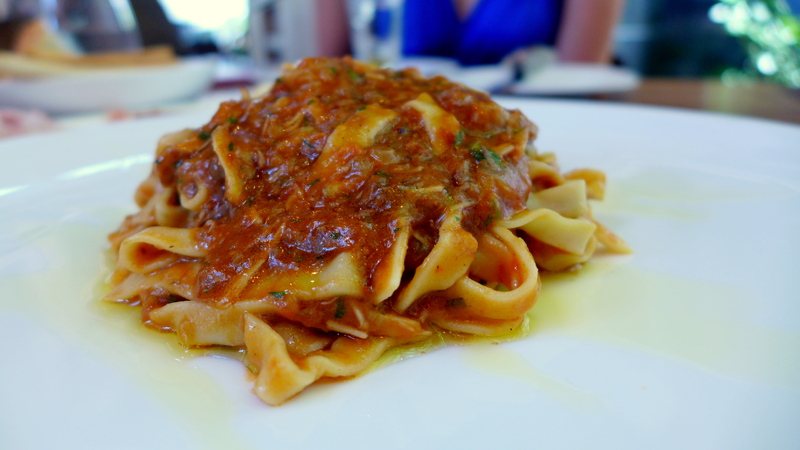 Whenever I see homemade pasta on the menu I’d have to order it. I’ve always believed that all Italian/Mediterranean restaurants should make their own pasta because it’s so simple, and far more superior in taste. I have fond memory of the good old Napoletana Ragu so this was an obvious choice for me. Look at sauce embracing every strand of pasta. So much flavour! As expected the sauce was packed with sweet essence of swine and the tang from tomato, with just enough herbaceous note to freshen it up. The pasta was cooked perfectly. Comfort food definitely. My only regret is I didn’t finish that plate of pasta (was a little too eager on the cold cuts), I’m still thinking about it now. Poesy went for the Pork Burger (because the very attractive looking Lasagna Pesta with Clams had sold out, damn), and this beauty was propped on our table. It has very simple toppings. Just Tomato, Lettuce and some melted Mozzarella, and there wasn’t any relish or sauce. But then a very clever waitress pointed us to the various pickles and jam. Aha! 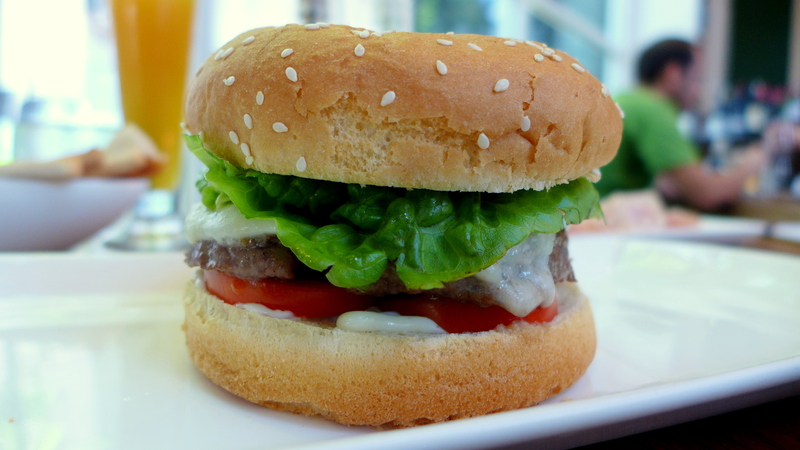 Perfect to pair with the pork burger. We might have added some extra cheese to buff it up. Ahem. Le Cross section before we embellished it. 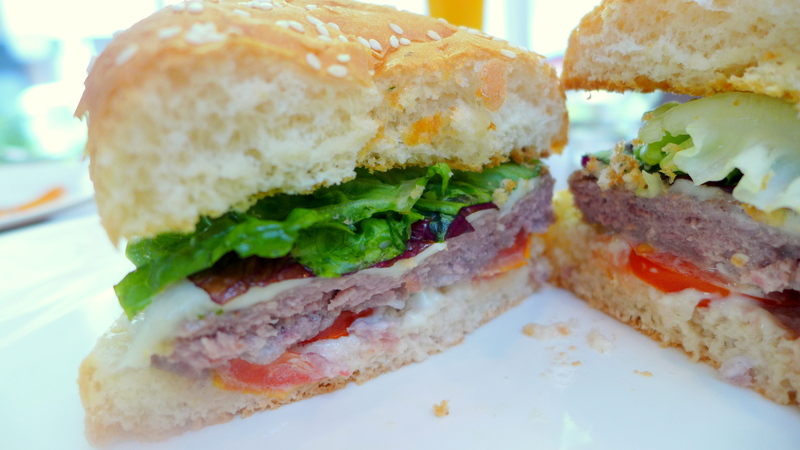 The patty itself is a little thin, but has good flavours. Not complaining though because we already had plenty of meat beforehand. I am a very bad girl (or good?) because I didn’t try the desserts! 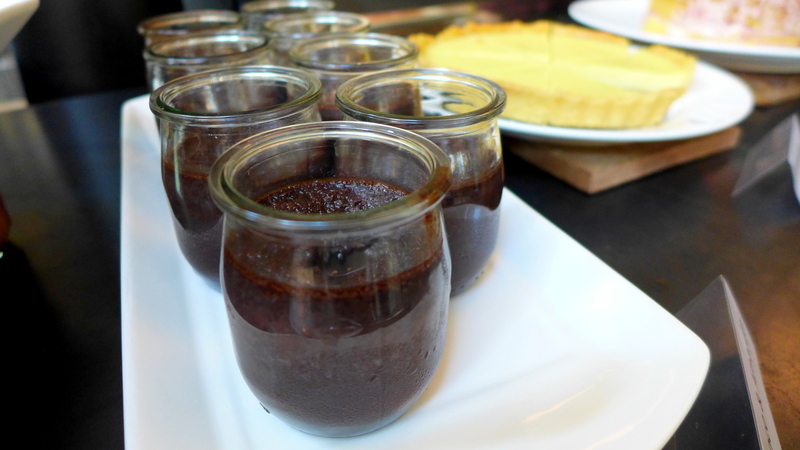 In retrospects these chocolate pots looked quite good and so did the lemon tart. Apart from the food, we also really enjoyed the Ice Lemon “Tea”. It’s more like a citrusy blend with a hint of passionfruit in it, very thirst quenching. Poesy had about the whole jug of it. I had quite a few myself. I like the simple decor with plenty of wooden furniture. It’s casual yet stylish and the ambience was pretty good with easy listening chill-out music soft enough for us to yak through the whole afternoon. We were there for almost 4 hours! No wonder the whole jug of tea. An afternoon well spent, I must say. I had a peek of their ala carte menu and I know that we’ll be back there soon. I heard tomorrow is going to be Greek themed, so if you are into Greek food do take the opportunity to check it out. Also and by the way, kids below 12 years old get to eat for free! Makes this a perfect place for family day out, don’t you think? 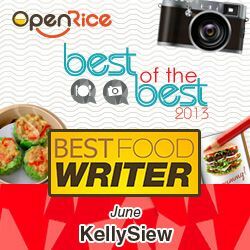 Totally agree with you Kelly, would be great if every restaurant that serves pasta can make their own. I’m a huge fan of pasta too! Yeah! Glad you agree. 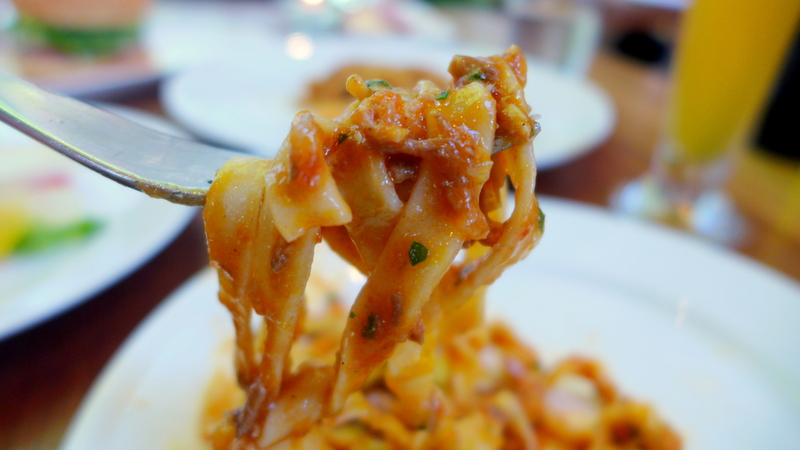 Nothing better than fresh pasta! 😀 Same goes for noodles. Start on 11.30am, its was too late for having breakfast lor…. It’s their current promotion. Usually kids don’t eat that much I guess. I can ask them specifically why. But this seems to be a common practise at a lot of places. Looks like a good deal. I wonder if they’re introduce a version with prosecco? I have suggested to them to add an alcoholic option. Hopefully they’ll do it! Food looks good. Looks like many places are coming back with all the porky delights now. Might as well – since saying that they “serve no pork” ain’t good enough. Hehe actually in Bintulu I never thought about pork free places since everywhere we go has pork! But seriously, cannot have Italian cuisine with beef bacon or worse, turkey bacon. Or no prosciutto! I can never go past homemade pasta (or any pasta, for that matter) either. Yum! Hehe yes! Not enough places do that nowadays. Was supposed to go for this too, but already had something on. The cold cuts look good, I can just survive on that. Loving this brunch event! Food looks fun and different too! I like it when the chefs are passionate about their craft!